In sublimation printing, just like learning any new process, there's a tendency to learn the basics and gloss over the finer details in the process. Our basic instructions are as guilty of this as anyone else's - we aim to give you enough instruction to successfully set up your sublimation business, without providing so much information that you feel utterly swamped. Well, today's an exception to that. Prepare yourselves to learn some information about Photoshop which may never come in handy, and probably won't woo any prospective dates. It may even squeeze some useful information out of your already-crowded brain, so caveat lector. We'll be taking a look at the difference between the various rendering intents available to you in Photoshop, CorelDRAW, and all the other programmes you might use for your sublimation printing. In our instructions, as mentioned, we tend to ignore this as an option and simply tell customers to select one and not change it. This is all very well and good for 95% of customers, as it makes no difference in the majority of use cases, but sometimes a customer will have a specific image which doesn't print properly, even though all their other designs are printed without any problems. 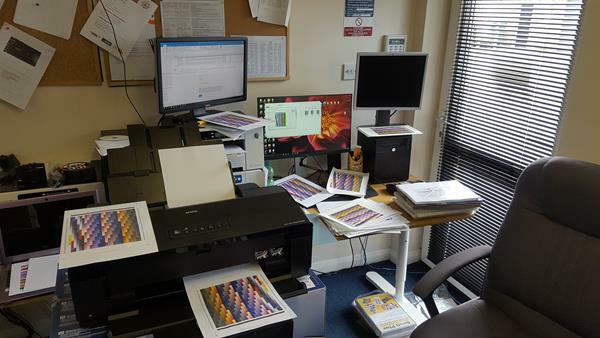 The problem in many cases is that the image cannot be printed completely accurately by the printer. And this is where your rendering intent comes into play. Depending on which you choose, the image will print differently. 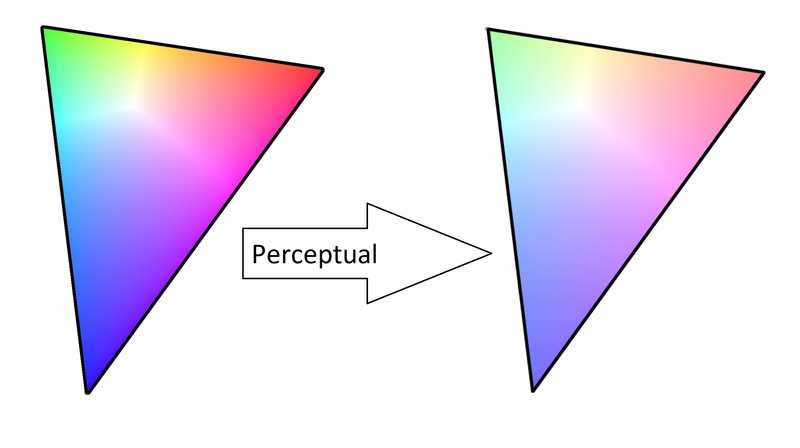 Perceptual rendering will squash the colours in an image until they all fall within the printable range. 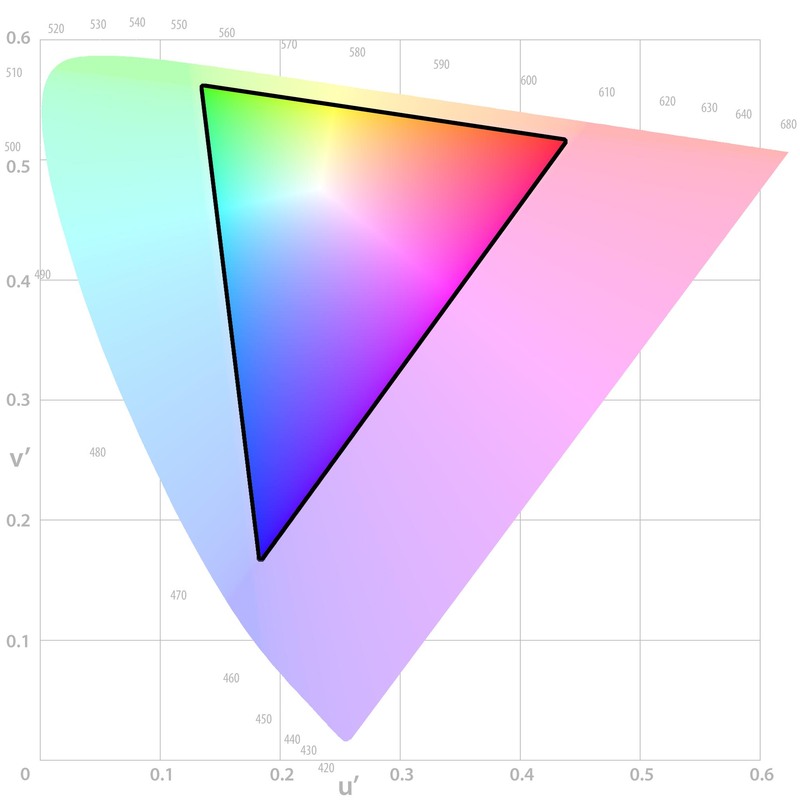 This means that if you have a steady gradient in your original image (such as the below), then the end result will be a steady gradient. Perceptual rendering intent is best for avoiding flat spots in a printed image, and preserving the overall "feel" of the design, whilst sacrificing accuracy somewhat. 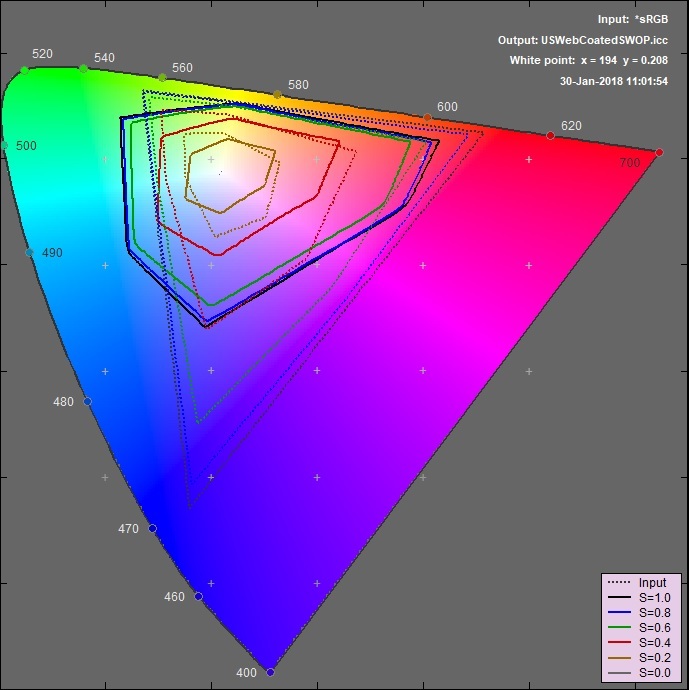 Relative colorimetric rendering tries its very best to preserve the original colours in an image, but for any unprintable colours the computer will just give up and pick the closest colour it can find. This will give the best results for things like skin tones, which needed to be matched exactly, but can leave you with flat spots in out-of-gamut (unprintable) areas. 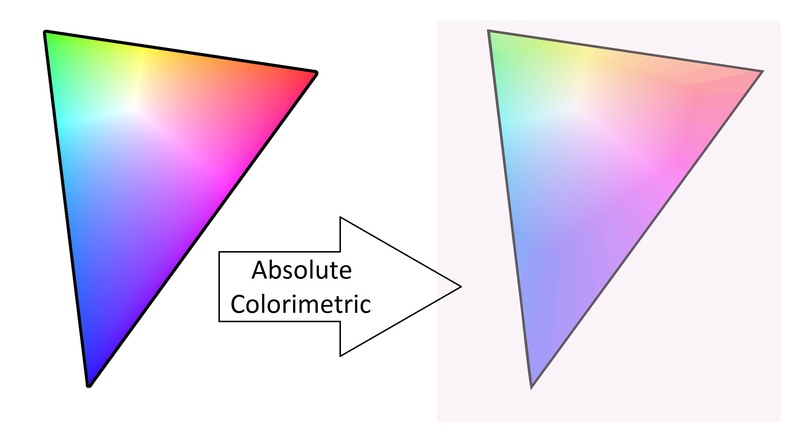 For sublimation printing, absolute colorimetric rendering is absolutely awful. 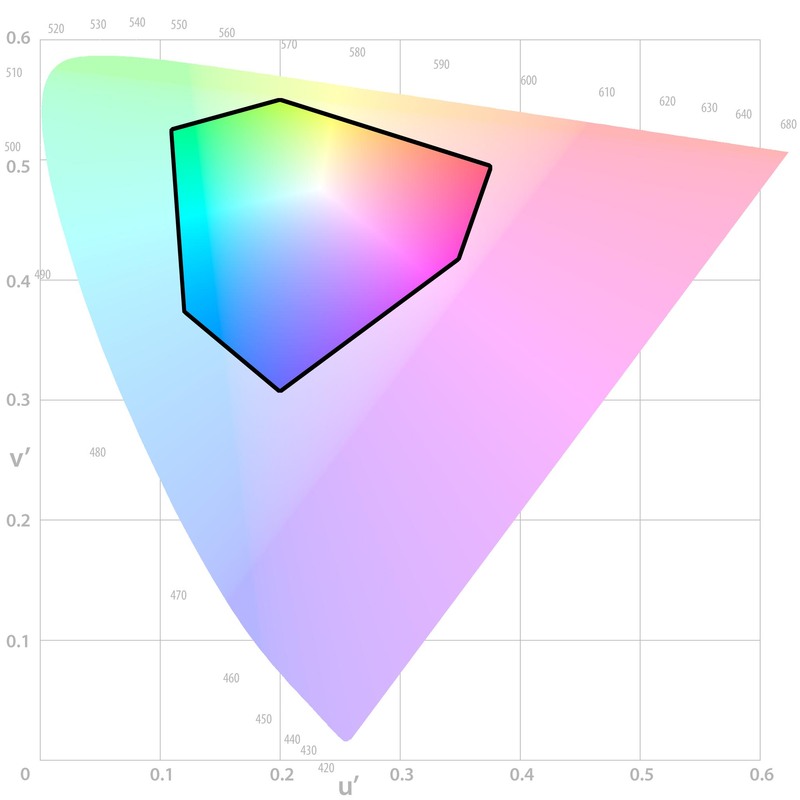 This rendering intent is usually used for "hard proofing" images, or printing them from one printer to try and see how they'd look on a different printer. This is only really useful if you're contracting out the printing of your images to another company, who happen to have a very large printer which has a smaller gamut than your printer, and who also aren't willing to do a test run to show you how the products will turn out. 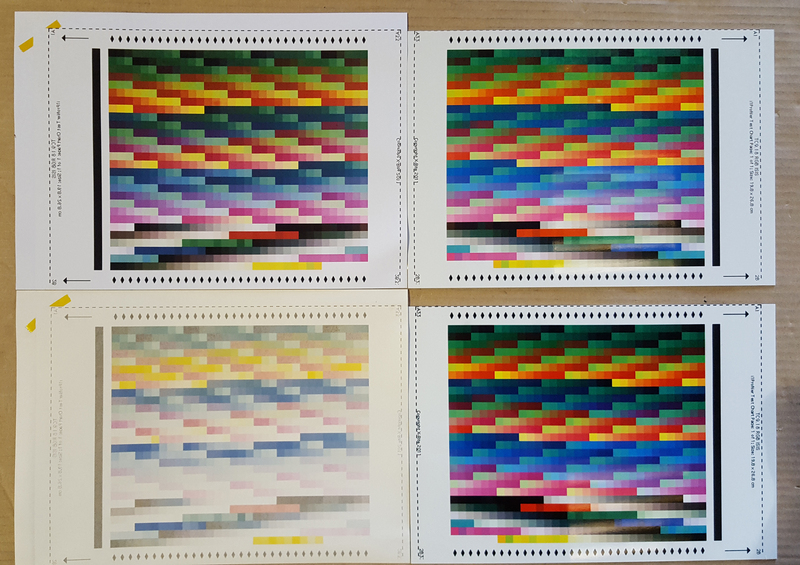 So, absolute colorimetric asks your printer to do its best impression of a different printer, using different paper. This produces such lovely effects as your printer trying to colour in all of your paper to make it look like another paper, which is supremely useless for sublimation printing (you'd end up with a big coloured square on your finished products). Similarly, do not use saturation rendering for your sublimation images, you'll end up with some terrible results. In the spirit of this post, though, we'll go ahead and explain it anyway. 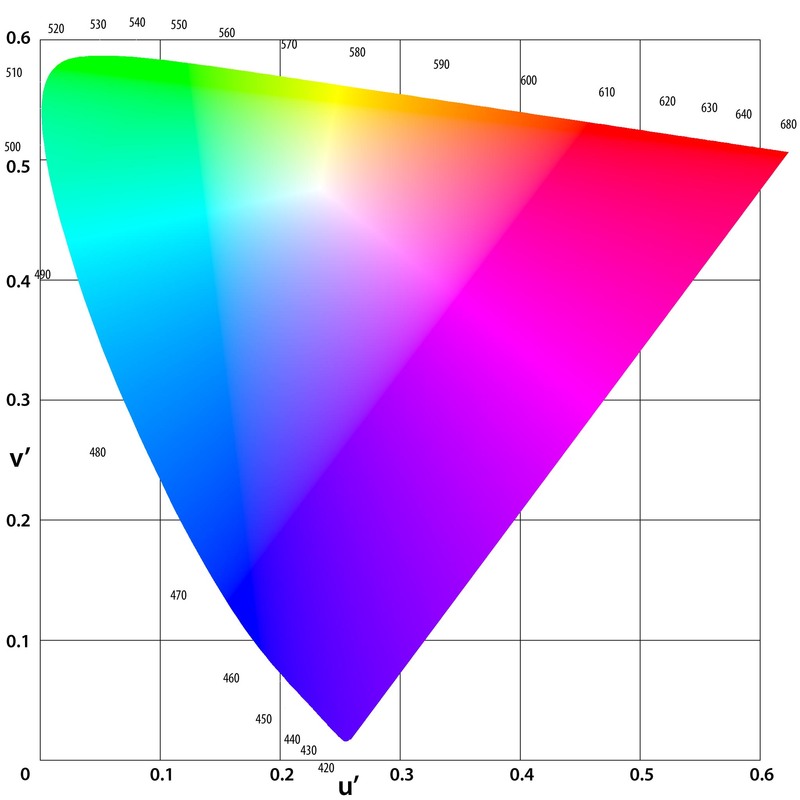 Saturation, as the name might imply, will try to preserve the saturation (or "boldness") of colours. 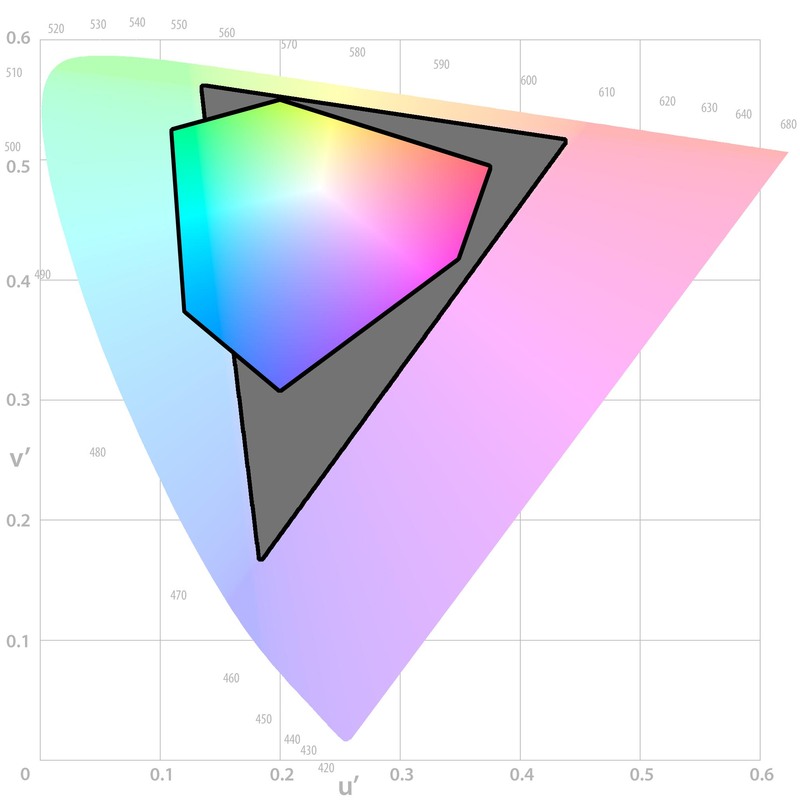 This works well for things like graphs and charts, where you don't care so much about the actual colours displayed, as long as they're nice and bright. This is quite difficult to show visually. 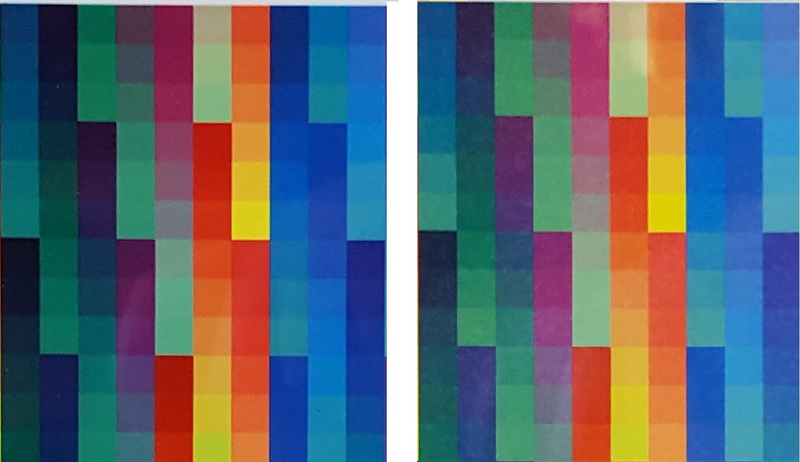 The best I could do is shown below - saturation rendering will take a colour from the screen (dotted lines) and change it to the nearest colour with the same saturation (same coloured line) in the printer profile (solid lines). If it doesn't make sense, don't worry, as you shouldn't be using this mode anyway. 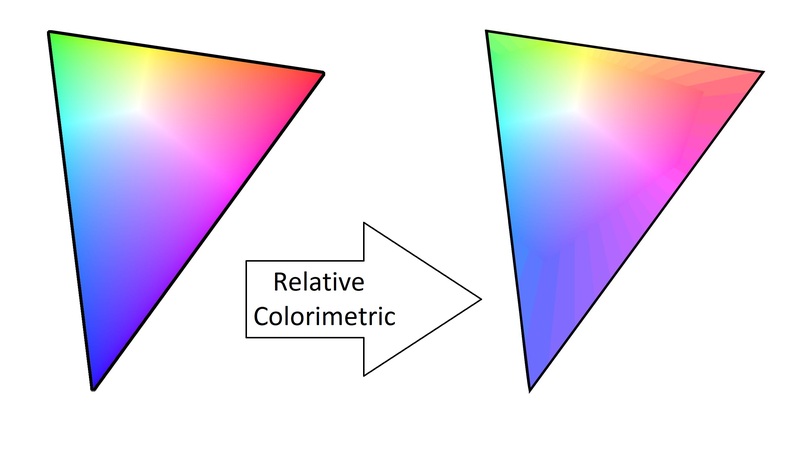 So in summary, you can use either perceptual, or relative colorimetric, rendering intent. Either will be fine for the majority of cases, but if you're trying to print colours which your printer can't accurately reproduce, maybe try the other one as well. Which is the best sublimation paper? This is the first in a series of posts looking at the entire process of sublimation printing, and how to choose products which work well together and help you to achieve the best results possible. When people ask us which sublimation paper is best to use with our inks, we always feel a little disingenuous recommending our own paper. Obviously we would say that, wouldn't we? 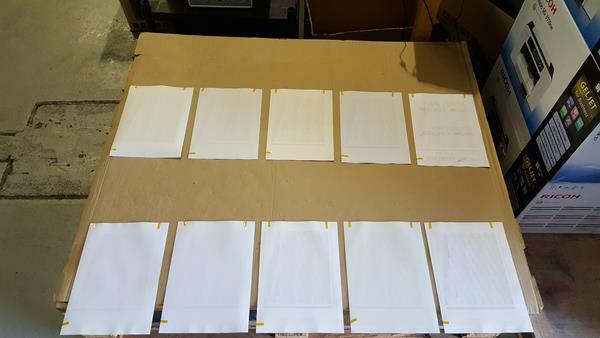 When we settled on our sublimation ink, we tested a lot of different papers in order to see which would work best, and to save our customers some legwork in testing out the different options themselves. We know that our sublimation customers are concerned with the quality of their products above all else, and were determined to find the absolute best paper to recommend - after all, it doesn't matter how cheap your mugs are if they look cheap. In order to demonstrate how our paper fares against the opposition, we decided on a simple test. We bought a pack of sublimation paper from ten of the main suppliers in the UK, printed the same image onto each, and sublimated them. So, with that out of the way, lets look at the results of our tests. We included papers from all of the major suppliers, to try and find a definitive answer to which papers work best with our inks. The printer used for this is the Epson 1500w six-colour A3 printer, and you might also spot a couple of Ricoh sublimation printers in the background - we'll be discussing printers in greater detail in another post. The first step was to print out our image onto each of the papers. 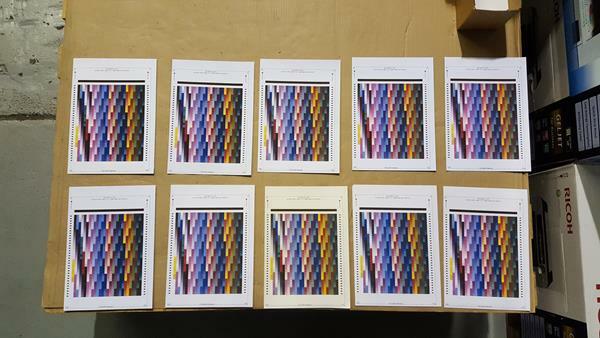 It's best to leave sublimation paper to dry for a few minutes so the ink can finish being absorbed before it's handled too much, so we ended up decorating most of the office with these sheets - the image we chose was a sheet of around 1,000 colour patches, for the greatest variation in colours tested. 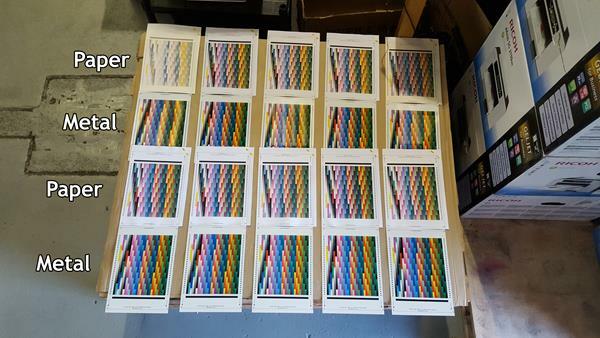 The images have now been printed, and are ready for sublimation - as you can see, there's very little variation at this stage of the process - all of the images were printed from the same printer, using the same settings. We sublimated onto white aluminium sheets, one of the easiest substrates to work with. Ours are from Subli Metals Ltd, who provide a huge variety of sizes and finishes. At this point, all of the images have been sublimated for 50 seconds at 180°C and we haven't seen the results - our paper is in the top left of this image. Enhance! Here's a closer picture of our paper compared to one of the others - you can see that a lot more ink has transferred across to the metal sheet with ours, giving much more vibrant colours - this will enable you to achieve the greatest possible variation in colours on your products. Enhance! Another, closer look at the sublimated products - the image on the right appears faded, and almost cloudy in places, because of the incomplete transfer of ink. We probably don't need to point this out again, but the one on the left was using our paper. An issue like this may not seem like much on an aluminium sheet, but is far too noticeable on photographic products such as mugs, or on t-shirts (which have a lot more material to dye). 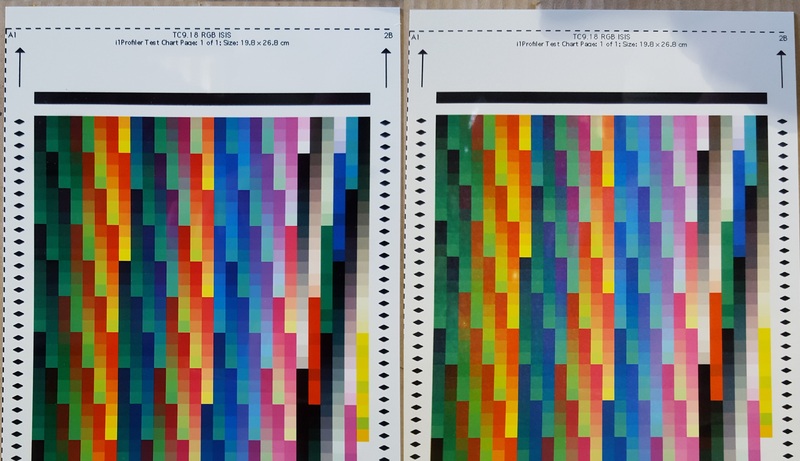 Having access to the largest possible colour gamut means you can consistently produce superb products for your clients, and we feel that our paper offers end results which outclass the opposition in terms of both ink fastness and ink transfer.